The Mathe Group received a Recognition Award from the Recycling and Economic Development Initiative of South Africa (REDISA) on Friday night to mark its contribution towards recycling used tyres that are becoming a major environmental hazard in South Africa. 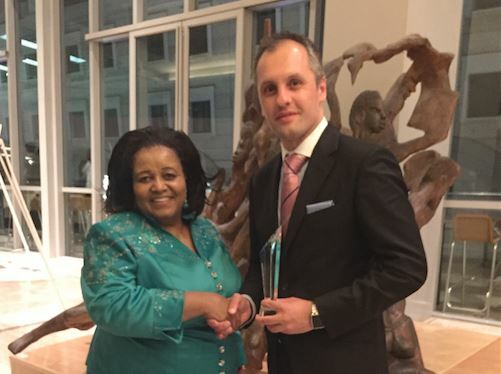 Dr Mehran Zarrebini, head of British investment group PFE International which is part of a joint venture with the Mathe Group and also owns Van Dyck Carpets, received the reward in Johannesburg. He said that this was a completely unexpected and much valued acknowledgement of all the work that the Mathe Group and its dedicated employees had done to establish a sustainable business. This is the first time that the awards have been presented by Redisa. REDISA was created in 2012 as an independent body to oversee and facilitate the recycling of the more than 60 million used tyres that have built up in South Africa over the years. It supports and promotes tyre recycling, providing the collection and depot infrastructure required to collect waste tyres from across the entire country and deliver them to approved recyclers. This is funded via a waste management fee on new rubber charged to manufacturers and importers. Dr Zarrebini said that the Mathe Group had been working with REDISA since September 2014. “REDISA has enabled us to focus on our core strength which is the manufacturing of rubber crumb. Prior to being registered with the organization, we had to source and collect tyres from various locations in KwaZulu-Natal. This was very costly and we were unable to secure a steady raw material supply. Since we started working with REDISA, this problem has been eliminated and we can concentrate on manufacturing as well as on developing new and existing customers,” he said. The award, he added, would be proudly displayed in the new premises that the group plans to open in Hammarsdale in KwaZulu-Natal in July. A multi-million rand investment by the joint venture partners has seen the construction of a completely new automated 2 500 sq/m factory and a 1 000 sq/m warehouse. It will be fitted out with R20 million worth of state-of-the-art equipment which is due to arrive in a month’s time. The Mathe Group, which was formed by Mr Vusumuzi Mathe in 2010, currently operates from a small factory in New Germany. It began manufacturing small quantities of rubber granulate from used truck tyres in late 2011. Once it had secured a permit to manufacture at full capacity in 2013, it began ramping up production. In 2014, a joint venture was formed between Mathe Group and PFE International Inc. The Mathe Group had supplied Van Dyck Carpets with rubber crumb since 2012 for the manufacture of acoustic underlays which are used under floor coverings to minimise noise between different levels in apartment and office blocks. “There was synergy from the start since Van Dyck was trying to source rubber crumb locally instead of either importing it or buying it from other provinces. This has really been a win-win situation for both organizations since the Mathe Group was looking at increasing its sales of rubber crumb and Van Dyck Carpets wanted to cement a relationship for its rapidly developing secondary industry,” Dr Zarrebini explained. Secondary processing has been a priority at Van Dyck Carpets since 2012 where the emphasis is on developing unique and differentiated products for the flooring industry globally. “We have placed a strong emphasis on manufacturing product utilizing recycled content. We also realise that there is an increased preference from consumers to source products that are manufactured sustainably,” he explained. Although there has been a steady increase in the production of rubber crumb since the first quarter of 2014, a substantial increase in capacity is expected towards the end of this year as the new plant comes on stream. An increase in the secondary processing side of the business at Van Dyck Carpets will correspond with this. Dr Zarrebini said the growth of the Mathe Group was a true success story. When the joint venture was formed last year, the company employed 12 people. This has since more than doubled to 29 as the small, original operation is now operating 7 days a week for 24 hours at full capacity. He pointed out that, as recycling of waste tyres for use in secondary products was relatively new in South Africa, it was necessary to develop skills in this area. “When we relocate to the new premises, we will be able to leverage from the very active skills and development programs taking place in Mathe Group’s sister companies. Both PFE Extrusion and Van Dyck Carpets are active in the development of their employees in areas of adult education training, supervisory skills development and so forth. The idea is to incorporate Mathe Group into the overall group to create uniformity with regard to training across all the subsidiaries,” he concluded.